I don’t know about you, but I tend to side with the “better safe than sorry” adage when it comes to turning on my car headlights. The sun has already risen when I go to work at 7 a.m. these days, but it’s not fully light out yet and I’d rather have people see me on the road. Same is true for dusk. That’s when I have the hardest time seeing on the road, so on go the headlights. Rainy weather, fog, snowstorms (back when I lived in Wisconsin, anyway). I turn my lights on for all these conditions. But lately, I’ve noticed more drivers not using their headlights during foggy weather or at dusk. So I looked up the Texas rules regarding headlights and realized they’re not in the wrong. They may be idiots and jeopardizing their lives and others around them, but they’re following Texas rules (probably the rules in most states). The rules, by the way, state that (for vehicles) headlights must be turned on from 30 minutes after sunset to 30 minutes before sunrise. Motorcyclists should have their lights on during the daytime, too, says the DMV website, to increase their visibility to motor vehicles. Well, that makes sense. But what about those teeny, tiny electric cars that look like a decent wind would blow them over? I met one going home the other night at dusk, and I barely saw it. I could easily see how other drivers would miss it on the road. Wouldn’t a headlights–always–on-rule reduce the chance of not seeing a car? I guess I don’t understand why headlights that turn on automatically when the car turns on — or at the least when a sensor detects low light — aren’t a standard feature on every new car. Wouldn’t that enhance everyone’s safety? Even if it would cut accidents — deaths and injuries — by 5 percent, wouldn’t it be worth it? Not to mention the cost of damage or destruction of the vehicles themselves. By the way, the photo in this post was taken at 5:27 p.m. today. Sunset was at 5:32. So the vehicle in the middle of the intersection with no headlights on wasn’t violating any rules. But the dark cloud overhead had muted the light. So every minute it grew harder to see the lightless vehicle. I’m sure (at least I hope) that at some point, the driver realized it was getting dark and turned on his headlights. Had all cars come equipped with automatic lights, however, he wouldn’t have had to worry about it. It would have done it for him. 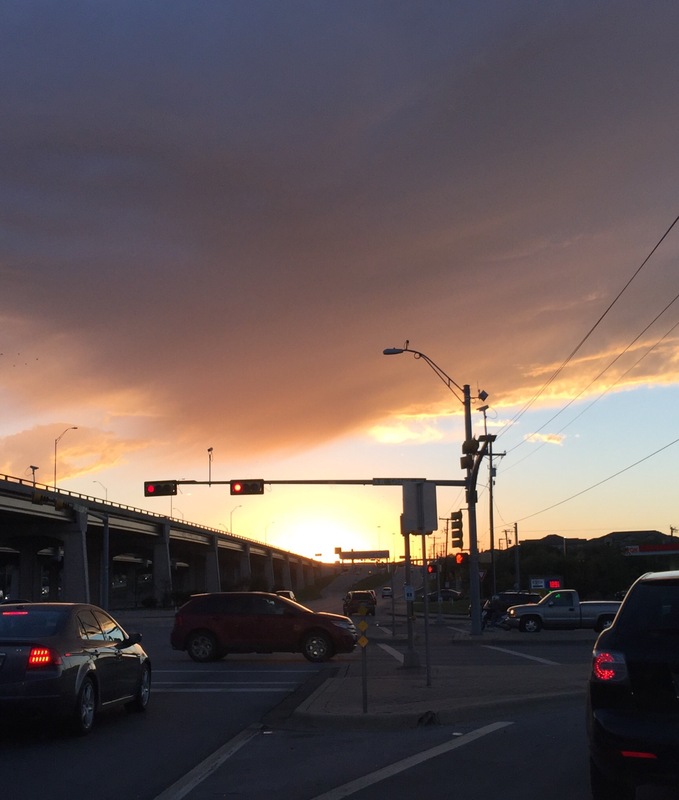 This entry was posted in Living and tagged driving laws, headlights on November 17, 2015 by Julie Riebe.